A few months ago, we got that phone call that all interior designers love to get—a client of ours wanted to have us come back and work on a new project in her home. 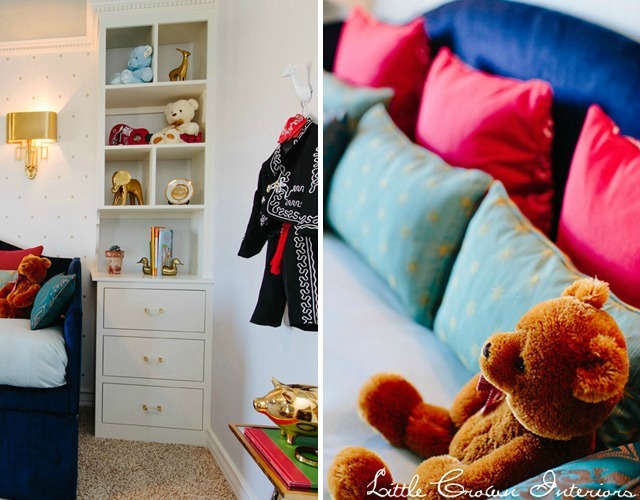 We worked with this client on her girl’s nursery a few years ago, and now she was ready for her little boy’s bedroom to be updated. The space was a bit of a challenge. His bedroom was small and the locations of the large sliding door and closet made furniture placement difficult—we really only had one wall to work with. The solution? We custom made built-in storage units, leaving a nice space in between them to fit a daybed. The built-ins act as both the dresser and bookcases, and there’s additional storage in the closet. Our client wanted a color palette that was fresh and modern but also had some traditional elements. We chose fresh whites and grays and toned it down with rich cranberry red and gold accents. 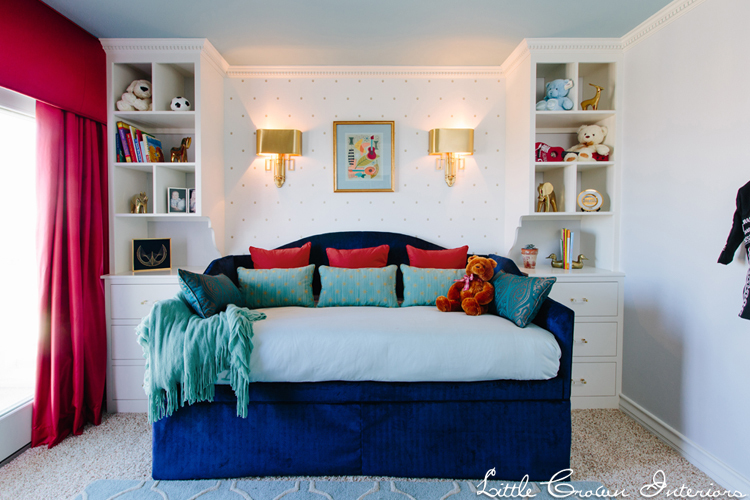 The daybed was upholstered in a navy blue velvet chevron. One of the most fun things about this boy’s room design was the theme. While very subtle, we incorporated a music theme into the space. This little boy taught himself how to search for Mariachi band videos on YouTube by age 2! To bring in some traditional elements, we added white and gold wallpaper behind the daybed and flanked the artwork with gold sconces since we didn’t really have room for table lamps. Of course, we had to include this adorable little toy guitar—and it actually plays! We chose a guitar with a red accent to coordinate with our luscious red curtains. The best thing about this design is that with a few minor changes, the room will work for toddlers and older kids alike! See more of this modern boy’s bedroom over at Little Crown Interiors. Great ideas! Don’t forget about childproofing doors with finger protectors for young children.